Specify how the menu will be defined. If the menu choices are not dynamic, then you can use the 'Menu Builder' or 'Static JSON String'. If you want the choices to be dynamic, use Xbasic function. Choices include Menu Builder, Static JSON String, Xbasic Function. Specify the JSON menu definition. Specify where the menu will be shown. Specify the width of the icon column. This is the column to the left of the menu choices where optional menu icons are shown. Specify if the window has a pointer icon that points to the element that was clicked to show the window. Specify the window edge that has the pointer icon. If you select 'Auto' the most appropriate edge is automatically selected. Choices include Auto, Top, Bottom, Left, Right. The height of the menu window. The height is defined using CSS units (200px, 1.5in, etc). This property is optional. If not defined, the menu height will be computed automatically. The width of the menu window. The width is defined using CSS units (200px, 1.5in, etc). This property is optional. 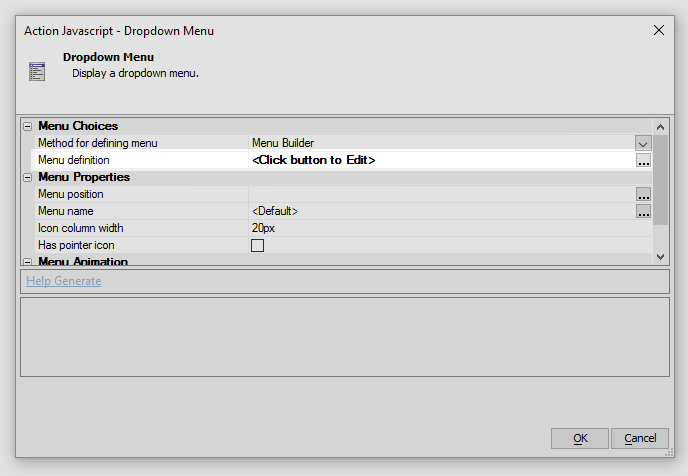 If not defined, the menu width will be computed automatically. Specify if the window should be animated when it is shown or hidden. 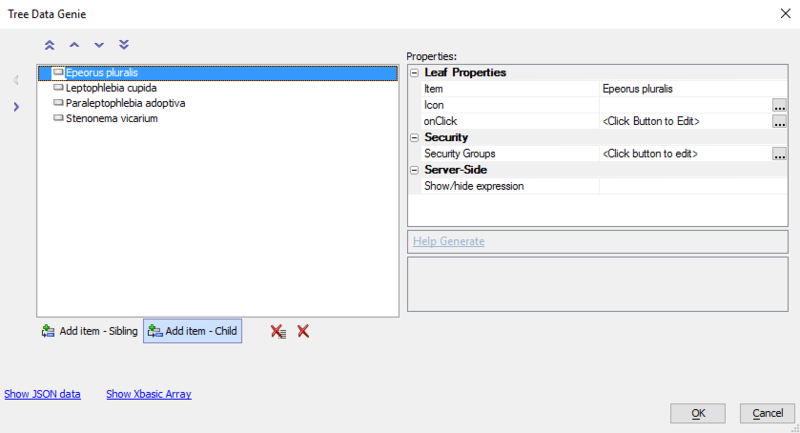 Create a list of choices for the dropdown using the Tree Data Genie.